Made from Almond Oil, Jojoba Oil, Beeswax, Honey, Aloe, and Vitamin E. Helps to keep lips smooth and supple in the harsh winter winds. Black Cherry Lip Balm has a wonderful black cherry taste, reminiscent of fountain sodas. All of our Lip Balms are all natural and have no animal fats. Chocolate Mint Lip Balm has a wonderful creamy chocolate flavor, complimented by a touch of peppermint. 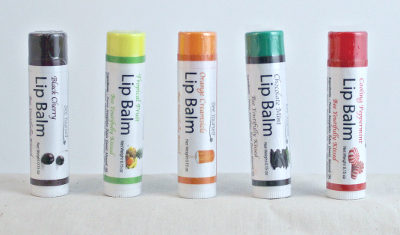 All of our Lip Balms are all natural and have no animal fats. Orangecicle Lip Balm has a sweet taste of citrus with a hint of cream. It is a wonderful alternative to the sharp mints. All of our Lip Balms are all natural and have no animal fats. Peppermint Lip Balm has a traditional peppermint flavor to heal dry, chapped lips. All of our Lip Balms are all natural and have no animal fats. Reminiscent of cool island breezes, this soothing concoction holds the flavors of Mango and Papaya. A limited item - a bag containing four lipbalms! What's special about it? Well, two of them are new flavors that are not yet featured on our website! Chocolate Seduction is reminescent of salty chocolate. Coffee Toffee has a Sunflower Seed Oil base (instead of Almond Oil), and satisfies the coffee lover in you. The other two - our pick! Be surprised!